I’m writing to let you know how much I enjoy reading your posts. Having been to London (and absolutely loved it!!) I somehow feel like I’m there, when reading your blog. I must also confess… I’m guilty of doing what others do…. enjoying someone’s writing, without letting them know. I too write a food blog – and people tell me everywhere but on my blog, that they enjoy my writing. I’ll keep reading and plan to be more vocal about it! 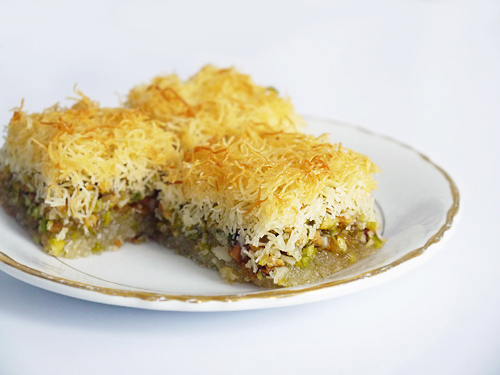 From your three baklava recipes, I like this the best. Just looking at it makes me drool, and I feel the urge to make this right away (but can’t). Then again, I’d much rather someone brought me a nice piece of this than having to make it myself, even though your instructions sound easy. I’m sure I’ll make this at some point to impress some guests. When faced with a platter of baklava I usually head for these first. When we were in Turkey I think I had baklava almost every dessert and sometimes for snacks too! I think this type of pastry is also used in Lebanese-style baklava, we usually order some at Christmas for gifts and this is one of the styles in the box as well. They also use the kadayifi pastry in the ones I call bird’s nests, with the pastry curled up into a nest shape with some pistachio “eggs” nestled inside. Anyway, I like that yours has cinnamon in it, I don’t think I’ve ever tried baklava with it. I can’t wait to try and make these! Delicious. It looks lighter is flavor than the traditional baklava. My goodness it looks amazing, would have liked to have been at that dinner party where you presented that. 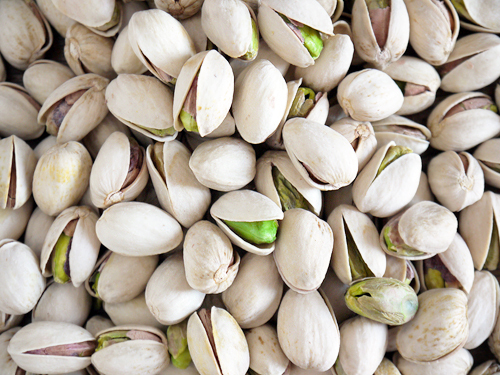 Well, I love those pistachios! I’ve taken to buying quite “normal” things when I travel, and I used to think “oh, it’s special, I can’t just use it like that” but I realised that then all these goodies sit in the cupboard and never get enjoyed. Recently, I’ve been quite happy to buy posh olive oil etc on holiday, then crack it open almost as soon as I get back.